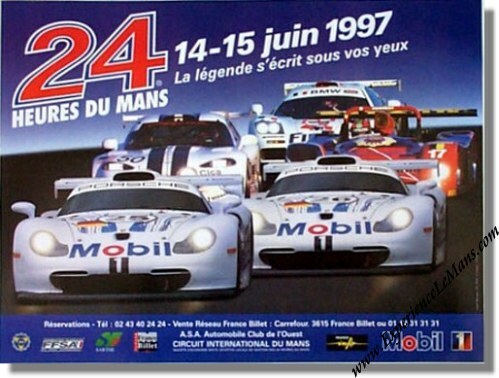 Original 1997 24 Hours of Le Mans Poster. June 14 & 15, 1997. The 1997 Le Mans poster was the last of the "The star car used for sponsorship" era in Le Mans posters which lasted from 1981 to 1997. Design of the 1997 Le Mans poster was in the hands of the Wake-Upp agency and was based on photographs by Guichaoua and Marguerat. This year shows the return of all categories of cars with three out of the four featured. The graphics mask the track and it again features the slogan "La legende s'ecrit devant vos yeux" which loosely translates into "The legends is written before your eyes". The race was won by Michele Alboreto / Stefan Johansson / Tom Kristensen in their # 7 Joest Racing Porsche TWR WSC 95 with a total of 361 laps to their name. For the full results of this race, please see 24 Heures du Mans results 1997.